This is our annual event where you get to snuggle with the herd’s youngsters, up close and personal and see the Appleton version of kid olympics (baby goats, that is). Bring the children but leave the dog at home, please. Wear your farm boots and dress for any weather. We’ll have plenty of cheese for sale, so pack your cooler too. Map to the farm is here. 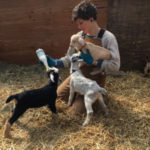 After you hug our kids, we suggest you catch some other Midcoast Cheese Trail members in the area, who are also hosting Kid, Lamb and Calf Hugging Day events.